1. The Crown Prince is on a three-country South Asia tour, starting with Pakistan. He was in Islamabad on Sunday but had to go back home for a day since New Delhi had reservations over his coming to India directly in the wake of the deadly terror attack in Pulwama by Pakistan-based Jaish-e-Mohammad. He is expected to travel to China next. 2. The Saudi leader will be given a ceremonial welcome at the Rashtrapati Bhavan on Wednesday. He is then expected to meet Modi for bilateral talks and the PM will host a lunch in his honour at the Hyderabad House. President Ram Nath Kovind will also be hosting an official banquet for the visiting dignitaries. 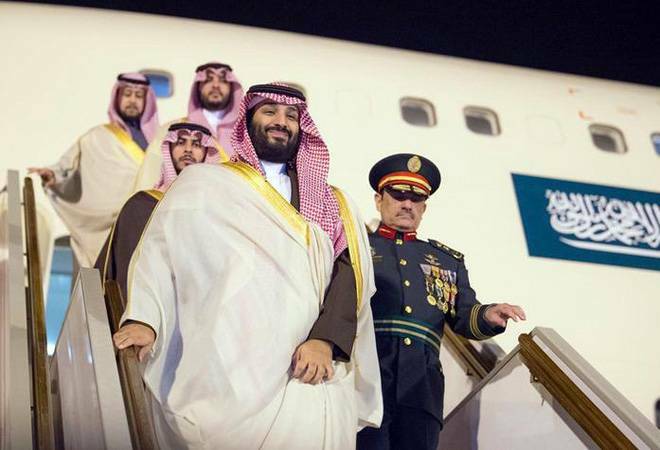 The Crown Prince will be accompanied by a high-level official team as well as a large business delegation. 3. During the two-day visit, India is likely to strongly raise the issue of Pakistan-sponsored terrorism with the Crown Prince, officials told PTI. The buzz is that the two countries may issue a strong statement on terrorism. Saudi Arabia vowed to “de-escalate” rising tensions between Pakistan and India during the high-profile summit in Islamabad and Salman stressed that “dialogue” is the only way forward in a joint statement issued at the end of his visit. However, Modi made it clear yesterday that “the time for talks [with Pakistan] has passed”. 4. In the first leg of his tour, Salman signed deals worth $20 billion which has come as welcome relief for cash-strapped Pakistan. According to Mint, this has been highlighted by Pakistan media and the government as a sign that India’s recent efforts to diplomatically isolate Pakistan are not succeeding. 5. According to TS Tirumurti, Secretary, Economic Affairs in the External Affairs Ministry, both sides are also expected to sign five agreements in areas of investment, tourism, housing and information and broadcasting during the Saudi leader’s visit. “We are confident that this visit will open a new chapter in India-Saudi bilateral relationship,” he added. 6. Moreover, India has been identified as one of the eight strategic partners with whom Saudi Arabia intends to deepen partnership in areas of political, security, trade and investment and culture. “As part of this engagement, we are finalizing the setting up of ‘Strategic Partnership Council’ between the two countries at ministerial level,” said Tirumurti. 8. Apart from defence and counter-terrorism, other issues likely to come up for discussions during Prince Salman’s visit include investments, food security, infrastructure and renewable energy. Saudi Arabia is India’s fourth largest trading partner and the bilateral trade is worth close to $28 billion. Saudi Arabia is also a key pillar of India’s energy security, being a source of 17% or more of crude oil and 32% of India’s LPG requirements. “We hope to transform this buyer-seller relationship in energy to a broad-based partnership,” said Tirumurti. 9. India is reportedly also looking forward to greater collaboration in the area of civil aviation, where there is considerable potential for enhanced links, especially in the context of increasing trade, tourism and in enhancing the convenience of travel. 10. But the upcoming visit already has a cloud cast upon it in terms of India’s efforts to list JeM chief Maulana Masood Azhar as a “global terrorist”. The joint statement released by Riyadh and Islamabad on Monday underlined the need for avoiding “politicisation of the UN listing regime”, which is being seen as an apparent reference to India’s efforts. China, a veto-wielding member of the UN Security Council and a close ally of Pakistan, has consistently blocked this move.